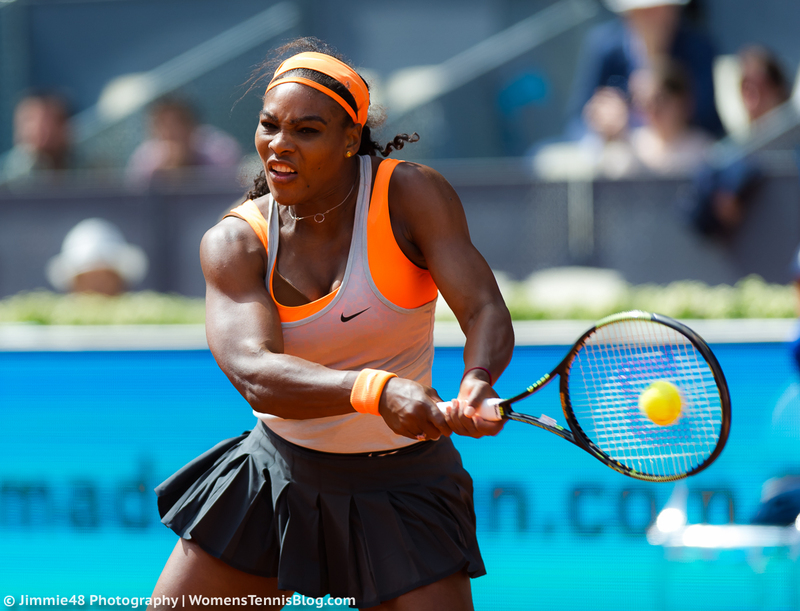 As women’s Grand Slam draws go, this is one of the most anticipated for years. The big storyline heading into Flushing Meadows surround the world number one, Serena Williams who is bidding for the Calendar Slam and her fifth consecutive Slam. It”s hard to begin to imagine the weight of expectation on Serena’s shoulders but if anyone can deal with it then it’s Serena. The 33-year-old matched her results from last year in Canada and Cincy; she lost a three set semi-final to Belinda Bencic, but won Cincy, beating Simona Halep in an excellent final. Serena’s form was wavy and there were utterings she may still be bothered by the elbow injury that forced her to pull out of Bastad and Stanford. However, she still proves to be very tough to beat, even when below-par. As i’m sure I have written before, it’s hard to analyse Serena’s draw because at a reasonable level, she beats everyone. Serena opens against the world number 86, Vitalia Diatchenko and could play Mirjana Lucic-Baroni in the second round (Simona celebrates…). The applecart could be rocked in the third round where she could play Sloane Stephens in what would be a blockbuster third rounder. Sloane has been steadily improving all year and has pushed Serena hard on a number of occasions. Before that’s a reality, Sloane has a really dicey opener against CoCo Vandeweghe. CoCo has won just one match since reaching the quarter-finals of Wimbledon but with that serve, she always has the potential to be a dangerous opponent. Serena is seeded to meet Agnieszka Radwanska in the last 16. There’s the potential for an Aga-Ula second round match which would be interesting, particularly as both players have spoken about their obvious dislike at playing each other. Aga’s first match of the tournament will be against Katerina Siniakova who hasn’t played for over a month after injuring her foot/ankle. Siniakova posted on her Facebook page three weeks ago that she “threw away the crutches” so I don’t expect a close match! Aga is projected to play Madison Keys in the third round. In her three US Open Series tournaments, Keys won one match at each but was unable to build on early promise. She plays Klara Koukalova in the first round who is 0-11 (!) in US Open main draw singles matches. Furthermore, Koukalova lost her last match in an ITF tournament in Prague to the world ranked 182, Laura Pous-Tio… it would seem to be an ideal opener for Keys. For the first time in her career, Karolina Pliskova will be a top eight seed at a Grand Slam. On paper it *should* help her chances of breaking new ground at a Slam where she is still yet to reach the second week. 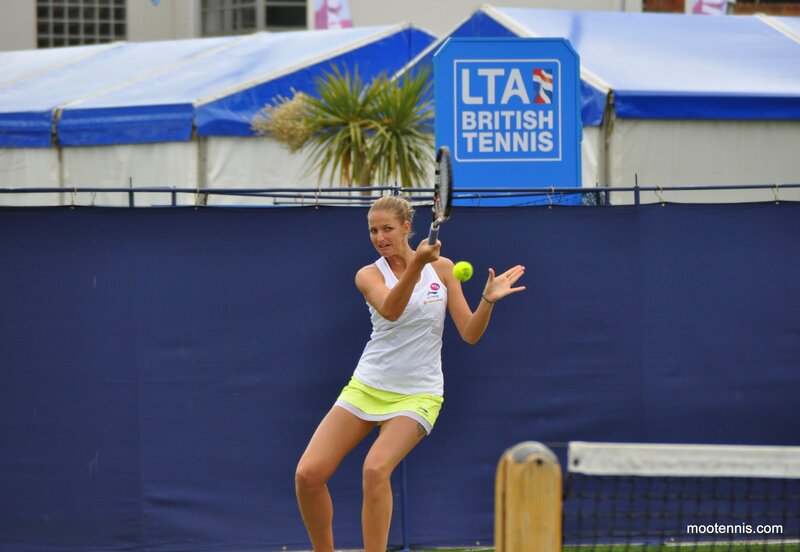 Pliskova’s form has been consistent all year although she has shown some frailties in recent weeks. After a tough loss in the final of Stanford to Angelique Kerber, her fourth loss in the final of a Premier event in 2015, Pliskova suffered two painful losses in Canada and Cincy from winning positions. She covered up the cracks with a couple of wins in New Haven but looked knackered in a 6-2 6-2 loss to Lesia Tsurenko in the quarters of New Haven. US Open preparations haven’t been ideal for Maria Sharapova who heads into the US Open having not played since Wimbledon. In fact, if she does take to the court at the US Open it will be mean she would have played three Grand Slams in a row having also played no grass court warm-up tournaments. While Sharapova comes in ‘cold’, she’s one of the best players out there at coming through the early rounds unscathed. Her overall draw looks decent but the first rounder could be a real humdinger… step forward, Daria Gavrilova. The feisty Russian/Australian beat Sharapova in Miami when she was not fully fit although the world number three did secure a win later in the year in Rome. In a recent piece on the WTA Insider, Sharapova said it is still a “day-to-day thing”. If Sharapova progresses past the first round she will play either Ana Konjuh or Tatjana Maria… i’d definitely like to see Sharapova-Konjuh in the second round. The other seeds in this section are Ekaterina Makarova and Elina Svitolina. Makarova’s been struggling with a lower leg injury and was forced to pull out midway during her Washington semi-final against Anastasia Pavlyuchenkova. She lost early in Toronto to Polona Hercog and then pulled out altogether of Cincy. It’s a good opportunity for Svitolina to better her previous best of a second round showing in New York. The 20-year-old opens against Elizaveta Kulichkova and then could meet Anna-Lena Friedsam or Kaia Kanepi in the second round. Friedsam is making her first appearance on the tour since hurting her ankle in Bad Gastein, while Kanepi has been playing only sporadically of late. The Estonian player won a round of qualifying in New Haven last week and is always capable of hitting a hot streak and taking out seeds. Ana Ivanovic, who is set to be working with Nigel Sears at the US Open, heads into New York after back-to-back quarter-final appearances in Toronto and Cincy. The year has been a strange one for Ana who was not 100% after injuring her foot in Australia and has never really found her mojo on a consistent basis despite a super run to the semi-finals at Roland Garros. The WTA Insider posted an interesting article about Ana where she spoke about feeling the effects of fatigue. There were more positive signs in Cincy where she hung tough to come from a set down to beat Sloane Stephens in the third round before seemingly running out of gas in her quarter-final against Serena Williams after being a set a break up and up in the third set too. Ivanovic has a meannnn opener against Dominika Cibulkova. 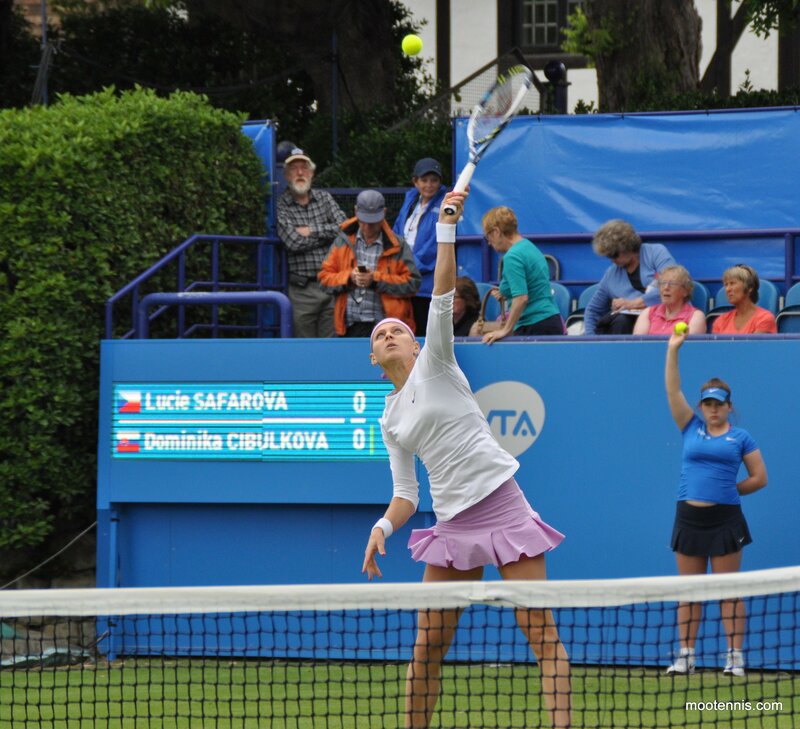 While the Slovak player isn’t quite there yet in her comeback from achilles surgery earlier in the year, her form was promising in New Haven where she played three marathon matches and spent eight hours and 53 minutes on the court, eventually losing out to Lucie Safarova, 6-7(4) 6-4 7-5 in the quarter-finals. Ivanovic’s eighth also features Carla Suárez Navarro, Jelena Jankovic and Eugenie Bouchard. Carla hasn’t won a match for over two months and is currently on a six match losing streak, while Genie suffered a really tough loss in New Haven, winning just one game against Roberta Vinci. After some encouraging displays in Cincy, it felt like a case of one step forward and two steps back. Interestingly, Genie was spotted with Jimmy Connors on the practice courts in New York but it was later denied that they are working together permanently. This… *whispers* could be a decent draw for Jankovic who is a former finalist at the US Open. She plays a really big hitter in Océane Dodin in the first round; the Frenchwoman hasn’t beaten a player in the world’s top 150 since defeating the world number 40, Alison Riske at the Australian Open. Still, it would make total sense for Jankovic to lose this match hahaha. So many of the top eight players have had issues of late and Petra Kvitova is no different. After a crushing third round loss to Jelena Jankovic at Wimbledon, Petra revealed in Toronto that she had been suffering with Mono. She battled on in Toronto and Cincy, losing her first matches, but enjoyed some superb wins in New Haven, defeating Madison Keys and Agnieszka Radwanska, Caroline Wozniacki and Lucie Safarova en route to defending her title. Petra’s early draw in New York looks favourable on paper; she will play Laura Siegemund in the first round and is seeded to meet the in-form, Anna Karolina Schmiedlova in the third round. Schmieds opens against Julia Goerges, while the winner plays Aleksandra Krunic or Danka Kovinic… two intriguing match-ups there. Krunic had a dreamy run at the US Open last year, beating Keys and Kvitova back-to-back, before pushing Victoria Azarenka the distance. Petra is projected to meet Garbiñe Muguruza in the fourth round. Muguruza is 0-2 since reaching the Wimbledon final with straight set losses to Lesia Tsurenko (7-5 6-1 in Toronto) and Yaroslava Shvedova (6-4 7-6, in Cincy). Muguruza has saved her best tennis for the Slams this year where she has reached the second week at all three so I wouldn’t rule her out just yet. She’ll need to play a good match though to get past Carina Witthoeft in the first round. Andrea Petkovic is also in this section and drew Caroline Garcia first up. Petko competed well in Cincy, reaching the third round and pushing Simona Halep all the way. However, she appeared to injure her knee and there was a video by @lawanda50 on Twitter of her ending a practice early and looking glum. Petko comfortably saw off Garcia at Eastbourne on her weakest surface, but CarGar’s looked kind of better of late. She won two matches at both Cincy and New Haven but ended both tournaments with heavy losses. Also watch out for Laura Robson who has a very winnable first match against Elena Vesnina, who hasn’t won a main draw singles match since the French Open (but snapped a five match losing streak in New Haven with a win in qualifying). Louisa Chirico, the 19-year-old American wildcard, is also one to keep an eye in this section after an excellent run to the quarters in Washington earlier this month. Defending final points, this will be a big fortnight for Caroline Wozniacki. The Dane has endured a miserable month, losing her first matches in Stanford, Toronto and Cincy. She has stemmed the tide with three encouraging wins in New Haven where she is, at the time of writing, currently into the semi-finals. Wozniacki saved three match points in her second round win over Roberta Vinci. One of the reasons for her poor results has been a leg injury that seems to have impeded her movement. As draw winners and losers go, I would class Caro as a winner. 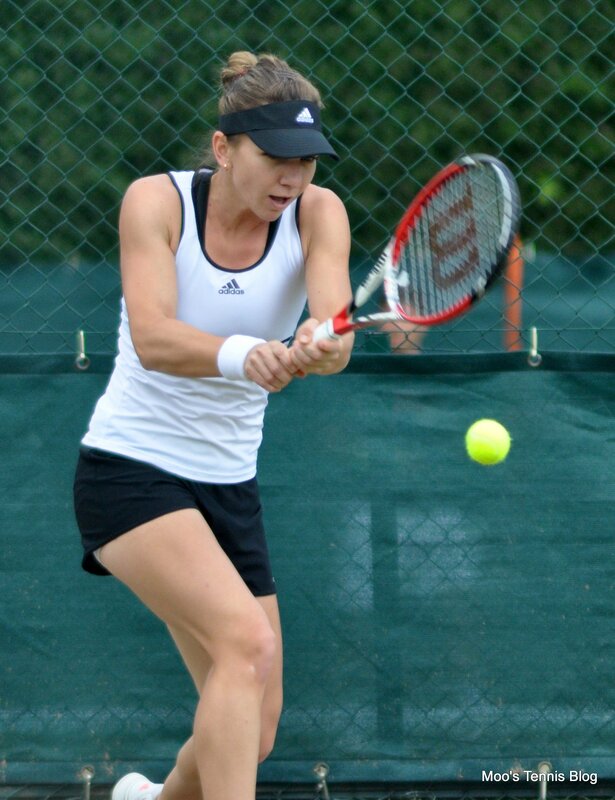 In the first round, she will play Jamie Loeb in her first professional match. Wozniacki’s section features Flavia Pennetta, Sara Errani and Sam Stosur; although all three players have had excellent results at the Open, Wozniacki has a winning head-to-head against all three. The Dane is seeded to meet Pennetta in the third round, who has a stunning record at Flushing Meadows. Pennetta has reached the quarter-finals on five separate occasions including in her last three appearances. Errani has reached the quarters in two of the last three years and is seeded to meet former US Open champion, Stosur in the third round. Sam faces a mental battle in the first round against Timea Babos who she lost to in Cincy, 7-6(6) 4-6 7-5 having been a break up in the deciding set. I probably wrote the same for my Wimbledon preview but I still can’t believe Lucie Safarova is a top eight seed! The world number six has had her best year on tour, reaching a first Grand Slam final at Roland Garros and winning her biggest title in Doha. While consistency hasn’t been as strong this year, it’s the successes that have completely made her 2015 season. After an early exit in Toronto and a three set defeat in the quarter-finals of Cincy to Elina Svitolina (where Lucie suffered her first bagel in two years), Lucie has played well to reach the semi-finals of New Haven, beating three players in a row who she had lost to in their most recent encounters. Lucie’s first round match won’t be an easy one against her New Haven semi-final opponent and one of the in-form players on the tour, Lesia Tsurenko. Upon reaching the semi-finals of New Haven, Tsurenko had won 20 of her last 23 matches on hard courts. In their only career match-up, Safarova beat Tsurenko in three sets at the US Open, 6-3 2-6 6-4 back in 2013. The big talking point of this section is that Victoria Azarenka and Angelique Kerber could meet in the third round. My first thoughts were to cry a lot haha. I’m gutted for Angie to get another rough draw after losing in the third round at her last two Slams to Garbiñe Muguruza. I would have had both Azarenka and Kerber going deep in this draw. Azarenka pulled out of her third round match in Cincy against Anastasia Pavlyuchenkova with a leg injury but pictures on Twitter seemed to show her without the mummy-like strapping. Simona Halep‘s year has been a real rollercoaster. The Romanian player struggled through the clay and grass court swings, but has triumphed on the hard courts; Halep has won three hard court titles in Shenzhen, Dubai and Indian Wells, reached back-to-back finals in Toronto and Cincy, and also made the semi-finals of Miami. Halep’s recent run has been all the more impressive as she has traditionally struggled to back up a good week on tour. Twice this year she’s gone a long way to disprove that in the Indian Wells-Miami and Canada-Cincy doubles. After a sluggish start in Cincy, she found her rhythm to play arguably the best tennis of those two weeks with a confident dismissal of Jelena Jankovic in the semi-finals, losing just three games, before giving a very decent account of herself in the final against Serena. August 30, 2015 in Tournament Preview, US Open, WTA. ← New Haven Final, Lucie v Petra! Azerenka to reach the final. Sharapova to beat Williams in Semis. Oh, I am a Sharapova fan, but I don’t think that’s ever going to happen..:( Though I hope so, but let’s be real-Serena is the best..
Masha won’t play in US O, announced right now. Where is Simona Halep ? If you do not Halep into account , you will make a great mistake. Vika Azarenka doesn”t seem to be in a great form. OK, it is your choice, but my choice is Simona for the final. All I know is that the stars have a line and Serena will win. This is Serena’ s year. I’m tired of these cupcake draw for Maria. Serena have tough matches right from the start. Why all the hate towards Serena. this is the last major of the year. It’s difficult to predict the US Open because the only active player with consistent records here is Serena. All the other top players have been SO up and down. I’ve been really impressed by how Halep has managed faster courts this year though and I feel like she could make a deep run. Wozniacki is fairly reliable here usually and could come through the bottom half. Azarenka is a question mark because of injury and Kerber just hasn’t delivered on the biggest stages in a long time. I think Bencic is the dark horse of the tournament. She’s improving so rapidly and this tournament is a great one for players who like to rush their opponents. Regarding Pliskova unless she addresses her focus,convert the BPs she has had recently in matches,where she has been in a winning position,she will not make the second week at the USO,she has been disappointing to me of late. There was a quote from Maria yesterday that sounded like she was going to pull a withdrawal so i’m not surprised. It’s a real shame and also for the draw which looks quite lopsided now.